It goes without saying that filing an insurance claim on your home after a hailstorm can be a long and complicated process. Oftentimes homeowners feel rushed to make decisions and quickly settle and don’t take time to consider their options. When Denny’s Eden Prairie, MN home was hit with hail, he knew that his LeafGuard® Brand Gutters and roofing needed to be replaced. However, when we met with him, he also asked for our feedback on ways to achieve a more comfortable and energy-efficient home. Here’s how we were able to help him out. Sun Tunnels & Skylights-Denny’s entryway, hallway, and interior bathroom lacked natural light. This configuration is common for 1970’s era homes. In order to introduce more natural light, we suggested the installation of three VELUX sun tunnels and a skylight. To maximize the amount of light that would be filtered into the home, we opted for a south facing installation. Denny even commented that after their installation, he went downstairs to retrieve a bottle of water in the middle of the night and was amazed at how much moonlight filtered in. Home Performance Testing-Before commencing any work at the property, we completed a home performance test. The utilization of a blower door gave us a solid blueprint for making the home as cozy as possible. With the help of an infrared camera, we were able to gauge the variance in heat signatures on the walls and in the attic. A smoke stick allowed us to see and identify areas where air was leaking. After our testing concluded, we were able to determine that the home had over 2500 CFM (cubic feet per minute) of air moving out of the home. We assured him that with our customized approach, we could get this number significantly lower. 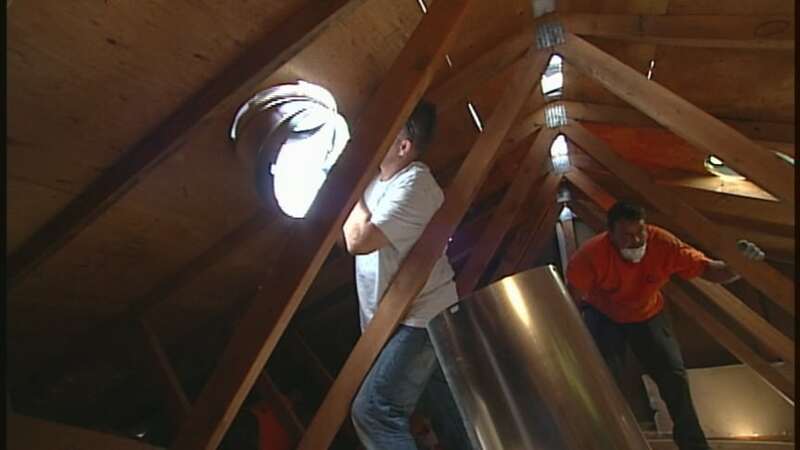 Insulation- A few years prior, Denny had asked us to complete some attic air sealing. However, since roofing was part of this project, we wanted to take a harder look at areas that are otherwise unexposed. When it was found that one of the can lights was non-IC Adding Blown Fiberglass on spray foamed areas (insulation contact) rated, we took the time to replace it so that it no longer presented a fire hazard if it shorted out. 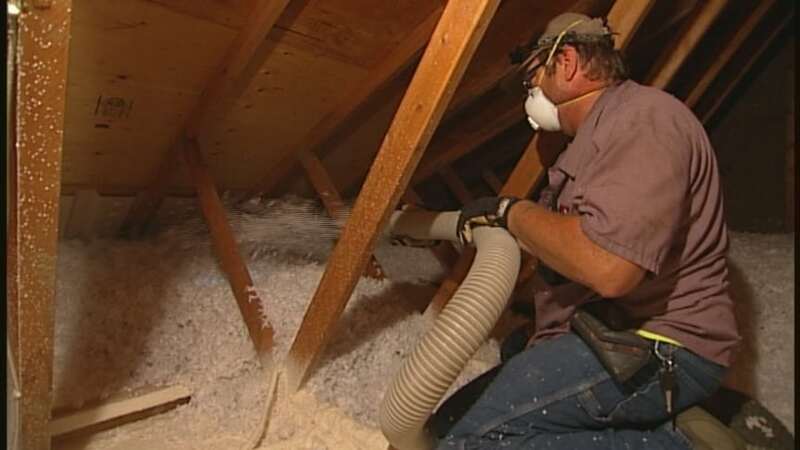 To take the attic to an R-50 rating, we first started by vacuuming out the old insulation. This allowed us to see all of the perforations in the attic. Next, a skim coat of spray foam insulation was applied and then fiberglass insulation was blown in. Our post project testing showed that the home was down to 1235 CFM, nearly half of what it had been. From a practicality standpoint, this change will cause the home’s HVAC units to run less. This equates to a longer lifespan of the unit and slashed energy costs. Wood siding and failing windows were taking their toll on this home. Here's how we improved the situation with LP® SmartSide® & SeasonGuard windows. "Chris and his crew were fantastic. They came on time, were professional and thorough, and cleaned up at the end of the day. They went above and beyond our expectations! We love our new deck! Thank you guys." - Melania A. “Everyone was professional and Andy took his time explaining the details including when materials would be dropped off, project start time and also arranged for a company to come out and run the underground drain system with pop up vent. Project was so much easier with Andy coordinating all the details.” - Art T.